Between fiddling with the stubborn overhead vent and jockeying for elbow-room with occasionally drooling strangers, it's likely that commercial air travel sparks your craving for a nice, soothing drink. This is why Delta Airlines, which recently made text messaging free on all fights, is increasing its already robust menu of complimentary in-flight booze with free glasses of prosecco. "Sparkling wine is often the first choice for a celebration and we know how special it is for people to jet off on a trip so we wanted to bring the celebration to them." The carrier isn't offering massive quantities of the Andre champagne ilk, so don't expect dousing your neighbor like you just won the World Series. But the smaller bottles of Avissi Prosecco in rotation should at least give you a first-class feeling in an economy class setting. Delta seems aware that offering finer amenities to every passenger is a best practice for any airline. Earlier this year, Delta announced the addition of complimentary prosecco on all first class and Delta Comfort+ flights. At the time, coach passengers had to shell out $9 for the same courtesy, but the carrier announced yesterday its new measure of popping sky-high bottles for every Delta passenger, free of charge. Plus, with the addition of free texting already in effect, the imperative to book holiday travel with Delta seems like a worthy option. 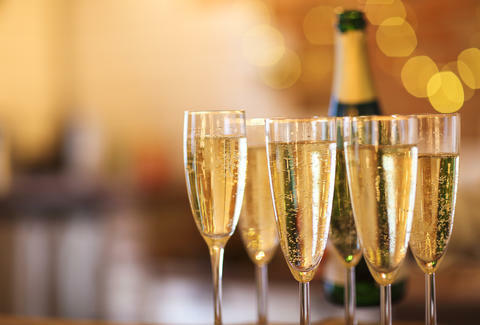 One small caveat, though: you won't be toasting the airways while en route from Cleveland to St. Louis, as prosecco is only available on Delta's international and long-haul flights. But given the relatively low cost of flying to Europe these days, it's likely that a journey across the pond is already within your reach, much like a celebratory glass of something fizzy.